Is Wireless Power Transfer Safe? This post is based on input from AirFuel Alliance members. With the increase in consumer electronic devices and the requirement to be ever more mobile, the topic of wireless power transfer safety and RF exposure has become increasingly important. In the following post we answer frequently asked questions related to the safety of wireless power systems. The summary is that well-designed “wireless charging” or “wireless power” enabled through near-field magnetic coupling (such as magnetic resonance) or far-field RF energy transfer are safe. These products are required to meet local RF exposure regulations. The method of wireless power transfer and the electromagnetic frequency used may limit the amount of power that can be safely transferred. Below are answers to the most commonly asked questions. Electromagnetic (EM) fields are all around us these days. Yet, we keep hearing electromagnetic fields are not safe. Are electromagnetic fields for wireless power safe? The ways in which our bodies interact with electromagnetic fields have been studied for a long time and are well understood. Products that generate electromagnetic fields are regulated by regional authorities e.g. FCC in the United States, to ensure specified safety standards are met. Any product which meets and/or exceeds the safety requirements is determined to be safe. Products which do not meet the safety criteria are not authorized to be sold. Can you explain how electromagnetic fields interact with our bodies? There are two primary types of electromagnetic radiation: ionizing and non-ionizing radiation. Ionizing radiation is radiation which can directly affect changes in the atomic structure of the body by ionizing atoms. Such radiation includes X-rays, Gamma-rays, and others above the frequencies of visible light e.g. petahertz to exahertz. Ionizing radiation is mostly used for medical and inspection technologies and requires more stringent regulation for exposure. Non-ionizing electromagnetic radiation is more common and includes wireless radios, Wi-Fi, and other general electromagnetic waves used for communication and power e.g. kilohertz to gigahertz. Non-ionizing radiation within prescribed limits is safe. Regional regulations ensure that products do not exceed certain levels of emission to prevent interference with other systems and to be safe for humans. Non-ionizing radiation typically does not cause any immediately noticeable effect in the body, however, at high intensities may cause tissue heating or nerve stimulation via an induced electric field in the body. SAR, or “specific absorption rate”, is the measure of power (watts) induced in tissue per weight of the tissue (kilograms). Induced electric field is the measure of induced electric potential (volts) caused by electromagnetic radiation across a given distance in the body (meters). Regulations are usually expressed in limits on these quantities. What are the differences between electric fields, magnetic fields, and electromagnetic fields? Electric and magnetic fields are both categories of electromagnetic fields. Whenever a time varying electric field exists, there is a corresponding magnetic field and vice-versa. Sometimes fields which have dominant electric potential are distinguished from those that have dominant magnetic potential. Each of these types of fields have different effects on the body and may behave differently around various types of materials. In this sense, it can be important to distinguish between the two types of fields and which is dominant. In near-field wireless power transfer technology, magnetic induction and magnetic resonance are based on transferring energy using the magnetic field component. Do cell phones emit electromagnetic fields like wireless power does? Yes. Like other products that use electromagnetic energy e.g. Wi-Fi, Bluetooth, etc., cell phones also emit electromagnetic radiation. Like all products that emit radiation, both cell phones and wireless power systems are regulated and required to meet certain standards. Cell phones are most commonly referenced because of how mobile they are and how close to the body they are used e.g. holding a phone next to your ear / head. Since cell phones must interact with base stations that are physically far from the user and the user is often holding the phone next to his/her head, RF exposure caused by cell phones may be higher compared to other types of products. Who decides what are safe electric and magnetic field levels? Each country determines which local regulatory body governs safety of non-ionizing electromagnetic radiation, often referred to as radio frequency (RF) exposure. In the United States, the FCC sets regulations for RF exposure. In other countries, there is usually a regional governing body in charge of setting regulations. Most regional governing bodies base regulations on well-known guidelines, studies, and standards that are published. The most common and well-known guidelines are produced by the International Commission on Non-Ionizing Radiation Protection (ICNIRP – www.icnirp.org). Who decides what level of RF exposure is safe and where are these guidelines? In general, each region has different restrictions with respect to RF exposure requirements. The most commonly accepted guidelines globally are produced by ICNIRP (http://www.icnirp.org) although many countries including the U.S. have similar but different restrictions so it’s important to check the specific restrictions for each region. The U.S. wireless power regulatory requirements can be found here and here. The applicable ICNIRP documents are the electromagnetic field guidelines from 1998 (which cover from 1 Hz to 300 GHz) and then the 2010 update to the EMF guidelines that modify the 1998 recommendations from 1Hz to 100 kHz. Can different countries differ on what is safe? Yes. Local regulations may differ from country to country, however, most follow similar guidelines. How is RF exposure measured to determine if the safety criteria are met? Method 1 uses measured electric and magnetic field levels and is the simplest way to confirm compliance, although the most conservative. These fields can simply be measured using a field meter in any area that would be exposed to a human. If the measured field levels are below the specified reference level, then the RF exposure level is considered safe and the requirements met. In method 2, compliance is determined by showing that any RF exposure does not exceed limits set for SAR and induced electric field (sometimes referred to as “Basic Restrictions”). For higher frequency ranges (above a few MHz), techniques have been developed and approved using basic fluids that mimic the EM properties of the human body to measure SAR. For lower frequencies, measurement methods have not yet been approved so validated simulation models must be used to show compliance. Both SAR and Ei limits must be met. Most of the world dealing with cell phones understands SAR very well but haven’t dealt much with Ei. The reason for this is simple, above 1 to 2 MHz, SAR is the dominant limit and the Ei is so much lower in comparison that it can be neglected (see figure below). Below 1-2 MHz the Ei is the dominant restriction that must be met, and SAR becomes negligible in comparison. Some people say that lower frequencies are safer to the human body because of SAR. So is the 100 kHz~200 kHz lower frequency wireless power (Qi) safer than the 6.78 MHz higher frequency wireless power (AirFuel Magnetic Resonance)? No, the assumption about lower frequencies being safer is false. Both lower frequency and higher frequency wireless power products are required to meet RF Exposure Basic Restrictions. Below 1 to 2 MHz, the Ei is the dominant restriction that must be met, and SAR becomes negligible in comparison. Lower frequency WPT Ei restrictions can, in some cases, be more restrictive than SAR restrictions at the higher frequencies (see figure above). Today the SAR measurement techniques are only available for 4 MHz to 6 GHz and above (where the SAR limit dominates). Therefore, companies producing products that do not meet reference levels and operate at less than 4 MHz must prove by detailed validation and simulation using human body models with the associated systems that the basic restrictions (both Ei and SAR) are met. The FCC in the U.S., for example, has a process that must be followed for code validation and the simulation, and then they review the simulation and results to ensure that the limits are met with reasonable confidence for any reasonable human interaction of the product. For 6.78 MHz high frequency wireless power (AirFuel Resonant), there is an example of a commercial 30 W product that passed SAR using measurement (not simulation only). Details can be found here. What is the difference between kHz low frequency inductive and MHz high frequency resonant wireless power systems? The inductive systems that we are aware of have historically operated from ~100 to 300 kHz (though technically they could operate at other frequencies). Resonant systems have been in operation from 20 kHz to 20 MHz, however, the AirFuel standards have chosen 6.78 MHz for a number of great reasons. The difference between inductive and resonant systems is determined (from a user point-of-view) based on freedom of movement, ability to operate through thick surfaces, and efficiency of operation over that range of freedom. Inductive systems typically have the same or similar size coils on the receiver and transmitter and require very high coupling (and hence tend to be lower quality factors). Resonant systems on the other hand do not need matched coil sizes, can operate over a wide range of coupling, and are typically high-quality factors (meaning less loss on the coil and so less heating of the coil as well). Historically inductive systems (such as Qi) have been able to get away with just using RF Exposure reference levels rather than having to meet the basic restrictions. This is possible simply because very little field is exposed since each coil is in close proximity and the field is turned off when the other coil is not tightly coupled. This, in turn, means that the only test is a measurement of field level being below the designated reference level for a given region. On the other hand, if that same system operating at 100 to 300 kHz were a resonant system (or even a very poor inductive system) and had mismatched coils to allow for greater spatial freedom then the field level of exposure may exceed the reference level. This in itself is not a problem; however, the vendor would be required, through tedious simulation (due to lack of measurement tools available below 4 MHz), to show that the basic restrictions are met (Ei in particular). The AirFuel Magnetic Resonant wireless power system operates at 6.78 MHz. The higher frequency provides some substantial benefits over lower frequencies (independent of whether the lower frequencies are based on resonance or inductive coupling). At 6.78 MHz, high Q (low loss) coils are possible using simple copper traces on a PCB or other common additive / subtractive processes that are already ubiquitous in electronics. Furthermore, eddy current losses induced in nearby metal objects are reduced with the square root of the frequency increase. This means that simple metal objects such as coins, washers, keys, etc. that easily heat up in the 100 – 300 kHz range are virtually unseen and don’t heat up at all by the systems operating at 6.78 MHz. Furthermore 6.78 MHz is an ISM band with unlimited radiation capability in most parts of the world. It is the only frequency currently recommended by ITU-R for consumer device wireless power transfer since it is recognized as having minimal or non-existent impact to other licensed bands. 100-300 kHz on the other hand, does have some areas of concern for certain LF and MF licensed broadcast bands and so very careful consideration has to be given at those frequencies. All wireless power systems are required to meet the basic restrictions to ensure they are safe to the human body. Below 1-2 MHz, Ei basic restriction limits are the dominant factor. 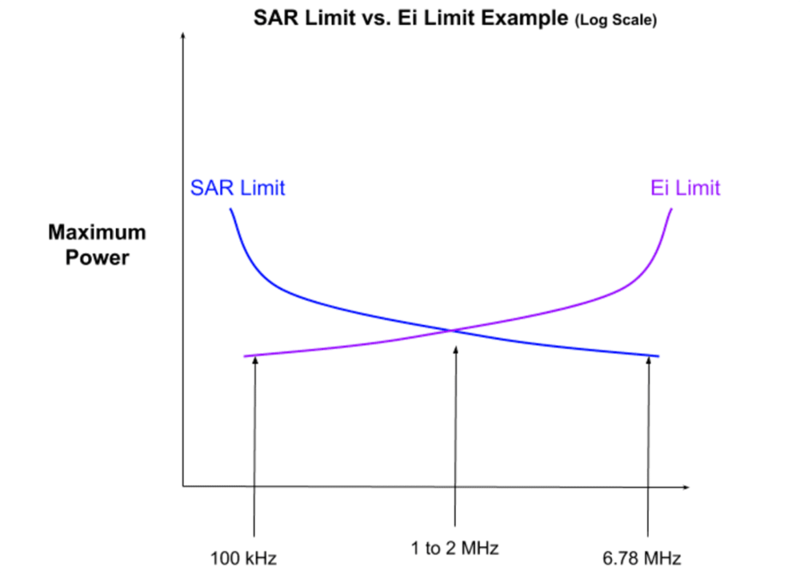 Above 1-2 MHz, the SAR basic restriction limits are the dominant factor. In all cases, if reference levels can be met then no further testing / simulation is normally required. If reference levels cannot be met, then basic restrictions must be shown to be met by either simulation or measurement. Currently, measurement equipment is only available for frequencies above 4 MHz. If you’re interested in more information concerning wireless power and safety, please email either Sanjay.gupta@airfuel.org, President of AirFuel Alliance or ky.sealy@witricity.com, Head of AirFuel Resonant Working Committee & Senior Engineer at WiTricity.